So excited to introduce my upcoming exhibition "We on the Horizon" at the Maison des Associations du 7ème in Paris this June by Gunidom! Click on the image for a preview of the work and come by for the opening on June 12th. Collectors are invited to reserve their place for a brunch by writing to contact@bethanna.fr. Presse release HERE. Preview catalogue HERE. From a selection of paintings from the series "We on the Horizon". Filmed and edited by Guillaume Lebourg @ CutAwayShot. For more paintings click HERE. 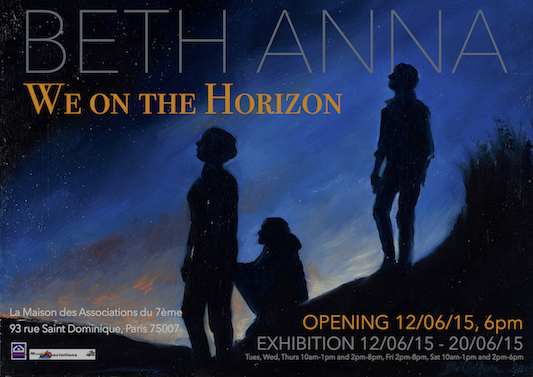 The emerging American artist Beth Anna will exhibit a series of paintings titled « We on the Horizon » this June in Paris at the Maison des Associations du 7ème. The director, Christine Tible-Grégoire, presents the exhibition that is sponsored by the association Gunidom. The title of the exhibition poetically ties together the works - representations of silhouettes on against expansive horizons. The singularity of this series is the ease with which the viewer finds in imagining themselves in the place of each silhouette. Beth Anna's work invites the spectator to be disencumbered of the weight of daily life and travel to places of wonder where the power of nature overcomes man and a gaze into the sky brings a sense of calm. In the current tumult of the world today, the images of her work remind us of the indelible value of life, a universality common to us all. An American born in Papua New Guinea, Beth Anna is a young artist that currently lives in Paris, France. A thirst for simplicity combined with an adventurous spirit have brought her to treat subject matter that deals with themes commun to humanity. Her work battles between the materialistic qualities of oil paint and the kitsch idealism of her hopes. Hers is a promising career to closely follow as she continues at an immensely productive pace and engages in the art world. « We on the Horizon » is the first exhibition of this series of work that will next be travelling to California. The opening will take place at 6 o'clock on Friday June 12th with a special performance by the dancer Titupröne Cécile Germain, a projection by the film maker Hadrien Touret, and a musical impromptu by Le Quart d'Heure Américain. An exclusive pre-opening for investors will take place during a private brunch on Friday in the presence of the artist. Interested parties are invited to contact the desk at 01 53 59 44 90 or contact@bethanna.fr. Copies of the exhibition catalogue are available online on ISSUU.